Bull trout are a char native to the Pacific Northwest that were listed as “threatened” under the Endangered Species Act (ESA) in 1998. There are several reasons for their decline in the Yakima Basin, including passage barriers, water quality, incidental take, illegal poaching, competition with non-native species, hybridization with brook trout, and decreased food sources. 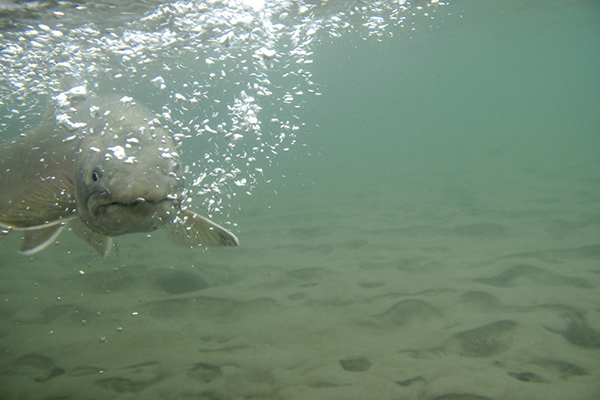 The Bull Trout Task Force was piloted in 2011 and is a unique project that provides an on-the-ground crew to reduce recreational impacts to bull trout. Objectives of the project include outreach to the recreating public, removal of recreational rock dams, monitoring passage conditions in spawning tributaries, population monitoring though redd and snorkel surveys, and assisting with special research projects. From 2011-2016, the Bull Trout Task Force has directly educated over 7,000 people, removed nearly 500 recreation dams to maintain fish passage for fall-spawning salmonids, assisted with numerous spawning surveys, and completed a handful of snorkel surveys. Mid-Columbia Fisheries Enhancement Group is a non-profit organization dedicated to protecting and restoring wild salmonid populations and their habitats through restoration, protection, education, and community involvement throughout our region.